The Cupcake Activist: My Two Loves! My two favorite treats are cupcakes and chocolate chip cookies. What a great idea for combining both! 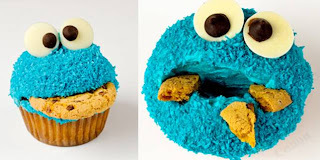 I love the person that thought of these Cookie Monster cupcakes. Cute! Now, go check out Carrie's blog at "Fields of Cake and other good things"..her newest cupcake will absolutely throw you over the edge! I've been meaning to let you know that on our visit to SoCal, I made it to the Perfect Circle! My sweet hubby brought me there before we even reached our destination (so scared they must have been to see me come in with a camera looking as good as I did after a seven hour car ride!) Anyhow, I tried the red velvet and it was tasty!! I love the shop. Very darling. I also want one of their tshirts, but they said they didn't sell them. Darn!I also got a slew of pics of cuppies at Disneyland, but couldn't bring myself to try one this time. They look sooo dry. Next month I will! I will post pics on my blog someday, if you are interested. Take care! Lisa- I'm so glad that you enjoyed The Perfect Circle AND got to try a red velvet. I have seen the cupcakes at Disneyland also, but I agree, they don't look too tasty (plus Disneyland has so many other tasty treats that I don't want to waste my calories on a so-so cupcake). Let me know when you post your pictures. Hope the rest of your visit was great!